Tea parties were the best of times during our childhood. It’s hard to top the afternoons spent wearing our mother’s oversized pearls, ten sizes too big heels and serving fake biscuits to our stuffed animals and imaginary friends. Was there ever a sweeter or more magical time? Shop With Us: We Found the Perfect Commuter Bag at Coach, Plus It’s 50% Off! Those childhood tea parties were so magical thanks to our imaginations, so we can’t help but try to imagine something that invokes that level of magic, but IRL. We believe we’ve found it in this pretty purse from Coach and it may just add some elegance to our everyday life. Think tea party, but make it fashion. See it: Grab the Coach Parker 18 bag for $275 available at Coach! The Coach Parker 18 bag is the perfect solution for the adult who’s looking to not only have their tea but wear it too. This delicate and feminine bag is the perfect option. The Parker bag is structured yet lightweight as well as the most perfect combination of uptown elegance and downtown ease. 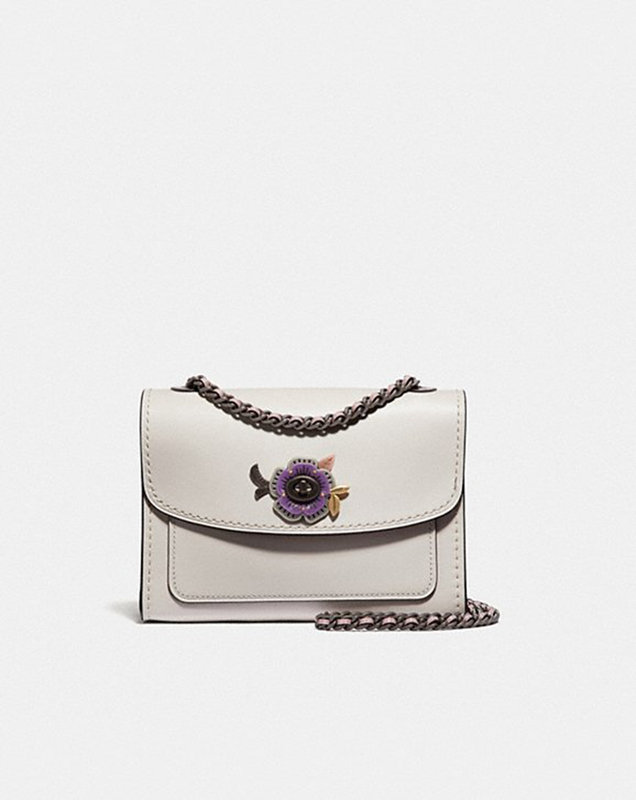 The mini bag is crafted with refined leather and is finished with a custom metal and resin stone Tea Rose turn-lock closure. We can’t help but think how absolutely beautiful the flower detail is on the Parker. It’s ideal for the adult who is still a child at heart. We absolutely adore! The Parker isn’t just stunningly designed, it’s practical, too. It’s a fact of life that adults are more prone to select and incorporate pieces into our day-to-day lives that are more about function and less about fun. We just need that versatility at a moment’s notice. Ultimately, we strive to find pieces that can transition from day-to-night and can go from work hours to after hours. Often times, the pieces that check all the boxes are boring and basic. The Parker redefines that standard. Instead, it’s delicate detailing and endless styling options make this bag a no brainer. The Parker’s handles convert easily to a shoulder strap. It’s so important to note that features just about a 21-inch drop as the bag can easily be styled over our arms or across our bodies. The strap is the ideal size — not too short, not too long, but just right. The Chalk-Pewter shade of this purse can best be described as the most perfect off-white hue perfectly paired with a hint of pewter. The fabulous single flower is the most stunning purple and features hints of yellow, green and what appears to be an orange detailing around it. We can’t help but lust over the delicate but intricate detailing of this purse. It is truly (and we mean truly!) stunning. So simple, yet oh-so-chic! Our minds are already in a fashion frenzy over the endless styling options. We plan on playing dress-up with this bag, just like we did when we were children. We can’t help but think about exuding that same elegance we once dreamed about at our imaginary tea parties. 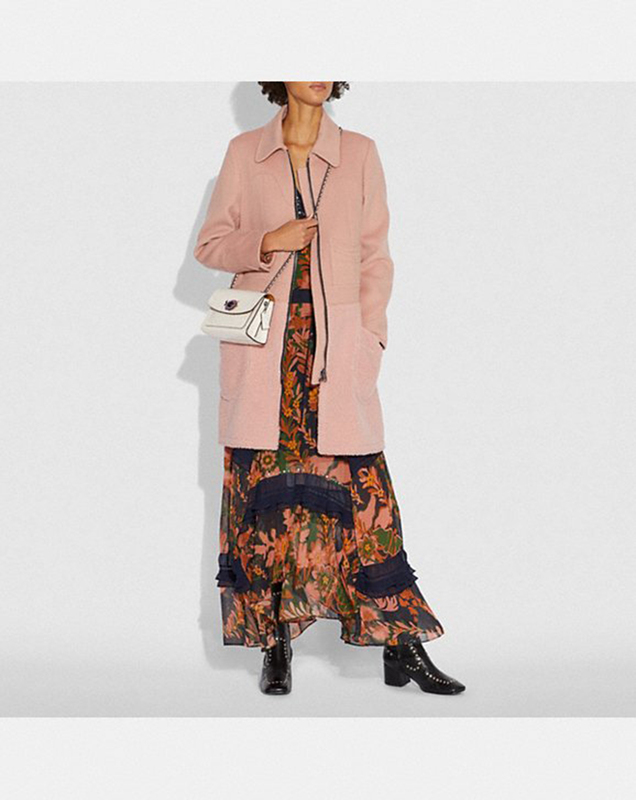 This would be beautifully paired with A-line skirts and sheer blouses. Or even chicer? Empire-waist dresses or perfectly tailored jumpsuits. Top any and all outfits off with a fun, faux fur! We can’t help but recommend that while fun prints are without a doubt cute, we can’t help but personally be partial to outfits with solid colors. The delicate, detail flower is so captivating, we wouldn’t want to compete with it. Instead, let it be the focal point of the entire outfit! We’re definitely lusting over the endlessly elegant style pairings, and since we love this bag so much, we know this bag will work in more practical situations as well. The Parker bag would pair brilliantly with oversized sweaters and jeans for a day-to-day look. And it was transition fabulously when trading in those same jeans for a high-waisted pair of leather pants and top off with a strappy stiletto, sandal. The Parker bag is so versatile we could even go as far as making a year-round staple as the beautiful off-white hue is ideal for all seasons! It safe to say, there is rarely a piece from our childhood that can be worn past it. Shoppers looking for a piece has the magic of childhood should look no further. The Parker 18 isn’t just magic, it’s magical. See it: Grab the Coach Parker 18 bag for $275 available at Coach! Not your style? Check out additional bags available at Coach!